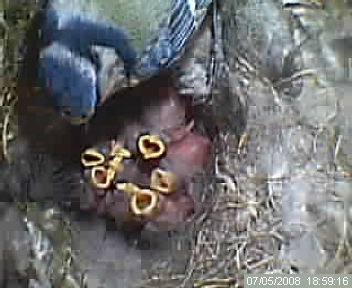 Daily entries in the nest box. Sometimes two visits in the day. From 12 to 20 visits per day. Many entries in the day. Very long visits to more than half an hour. Still many visits. And still no hint of moss. The nest is not yet begun. Numerous visits. A twig on 25. 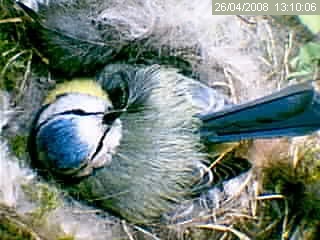 She sleeps in the nest box on February 27. She returned to sleep at night about 18.30 and leaves the nest box at 7:30 am the next day. A few strands of moss. She returned to sleep all night. Since 10 construction is started and will very quickly. 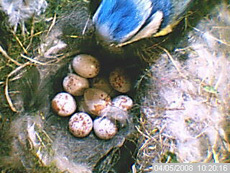 Nest building and short inactivity periods. The nest is almost done. Soft materials. Each day, one egg. April 23: 9. She begins to brood. 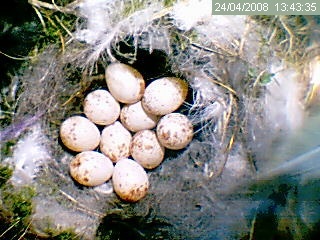 April 24: ten eggs. 8 days of hatching. Many feedings. 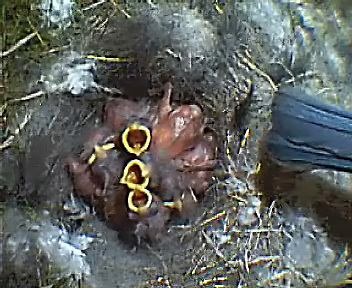 May 7: 8 chicks. 9? The father has disappeared on May 17. May 26: SEVEN HAVE FLEDGED!